Are you thinking about getting a rabbit for your child? Rabbits make wonderful family pets and children of all ages can participate in their care. However, rabbits are a 10 year commitment and no one should expect a child to maintain an interest in caring for a pet for 10 years. A rabbit requires daily care from a responsible adult. A child is very likely to get busy and not notice whether the bunny is eating well which could well end up being critical for the bunny. Rabbits will usually struggle strongly if they are picked up and under these conditions are easily dropped, especially if being held by a child. Such a fall can severely injure or kill a rabbit as they have very fragile bones. If picked up repeatedly rabbits will often shy away when approached or even resort to biting. They end up being an unsuccessful pet. Also, rabbits do not like loud noises or sudden movements both very often traits of small children. More information. To see Chili sitting like this you would never know that this little black Holland Lop had been kept in such wet and dirty conditions that a sore festered and abscessed on his hind foot. He was the responsibility of children and their parents paid no attention to him. He was taken to a veterinarian to be put to sleep. He got his second chance with us. Chili can no longer move his ankle joint but he gets about well in spite of that. Are you a teacher thinking about getting a rabbit for your classroom? Please take a moment to read the first part of this page as well as what follows. Rabbits do not like loud noises and sudden movements. Nor do they like to be handled excessively. While it is true that children can learn to be kind to a rabbit, keeping one in a classroom in order to do this is hard on the rabbit. A rabbit’s natural routine is to sleep most of the day. The classroom setting means that the bunny gets little rest amid the noise and confusion. Most classroom rabbits are shut alone in the school at night just at the time they are most active and in need of affection and attention. On weekends it is often the practice to send the poor bunny to a different house each time. Rabbits bond closely with their territory and their nature dictates that they know their surroundings well. Constantly being put in a strange environment is very stressful for them and can lead to aggression induced by fear. 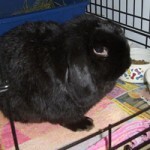 Some of the homes will be less than ideal with well-meaning people who know little about a rabbit’s care or health. Unsupervised small children in the home could injure or kill the rabbit by mishandling or feeding inappropriate foods. Along comes the summertime when school is closed and this time no one wants the bunny. Then he or she is taken to a shelter or put out in a park to die. Sound harsh? Believe us – it happens. Read here.